Ok - last week worked pretty well too... We went to The Firehouse on Monday night for the Dine Downtown, and it was AMAZING. We really appreciated going to a nice restaurant, getting great service and great food - especially since nights like that won't be in our future for a while once Baby L gets here. Or maybe she'll be like her daddy and grow up eating at fancy restaurants. Saturday: We'll be at the 2012 PRBO Rich Stallcup Bird-A-Thon Awards Event in honor of a good friend of my dad who passed away recently. Its also my dad's birthday. Sunday: We'll be heading back from the bay area - so again, something quick - maybe Pizza. 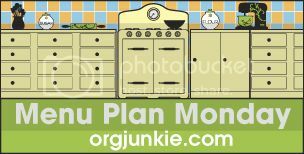 More over at Org Junkie!